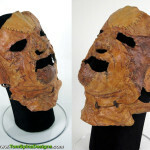 A blood splattered display fit for a Texas Chainsaw Massacre: The Beginning Leatherface mask. 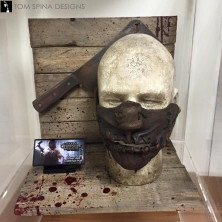 This latest movie prop display is for a screen used Texas Chainsaw Massacre: The Beginning Leatherface mask. This client was looking for a themed base that was as grungy and bloody and graphic as the film to display their screen used mask. Since we don’t have time for wood to naturally wear down and get that aged look to it we have to come up with creative alternatives. 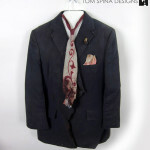 This can included a combination of different distressing techniques and finding the perfect mixture of paints and stains. The same went for the decorative meat cleaver hanging on the back of the display. When it arrived in our studio it was in pristine condition. That didn’t last very long! We also ground down the blade so that it was no longer sharp, a basic safety precaution (and something similar to what’s done for movie prop knives.) 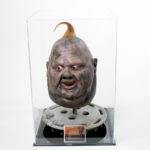 We even artificially aged and discolored the male styrofoam head that would eventually hold the screen used prop mask. 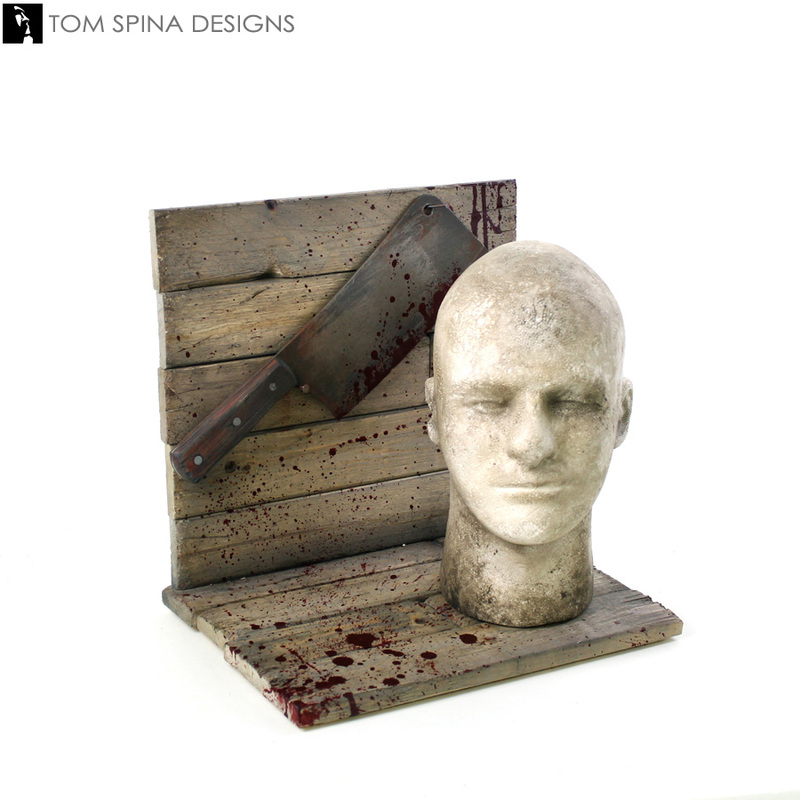 Once the wooden base and backer were assembled, then came the fun part, the blood splatter. Although it seems like a very random application it is actually a well thought out application to make sure the pattern looks natural and not overdone. It’s details like this that can help create just the right theme for your movie prop display, so if you’re a collector, you know who to call! 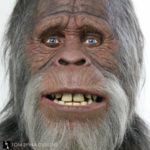 Want to turn your original movie prop or costume into a life-sized statue or museum display? Email or call today and let’s discuss your project!